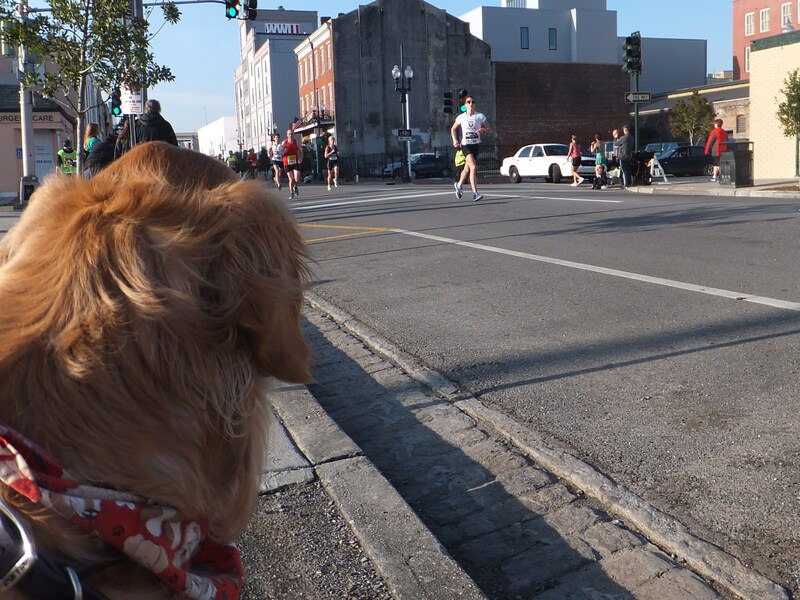 I was having so much fun wining and dining in New Orleans last Friday and Saturday that it might have been easy to forget I was there to watch my human daddy run the Rock ‘n’ Roll New Orleans Marathon on Sunday. It might have been easy to forget that, except for the small fact that my daddy could not stop talking about it. So we had to devote at least a little attention to his marathon. On Saturday morning, I helped my daddy go through his marathon paperwork before heading off to pick up his bib number, the little shoe chip that would time him, and a bunch of other stuff. My human mommy took me to the side and explained to me that we were about to go to a “geek fest.” She said that runners call it an “expo.” They get super, super excited about going to a convention center to pick up their “geek packet” and then walk through a huge hall that is filled with running stuff (she may not have used the word “stuff”). She said that sometimes they can spend hours in that hall just looking at running stuff, fantasying at booths that have information about other marathons they might run, and listening to people (she actually called them “other geeks”) talk about running. 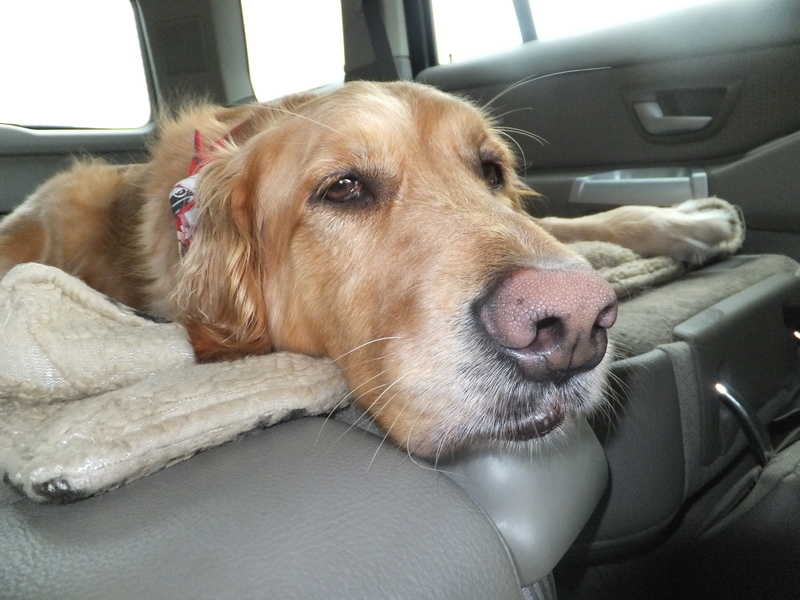 I have to admit that I was a bit horrified about accompanying my daddy to his expo, or geek fest, or whatever I was supposed to call it; but, being a faithful Golden Retriever, I put on my happy face and headed out the door. 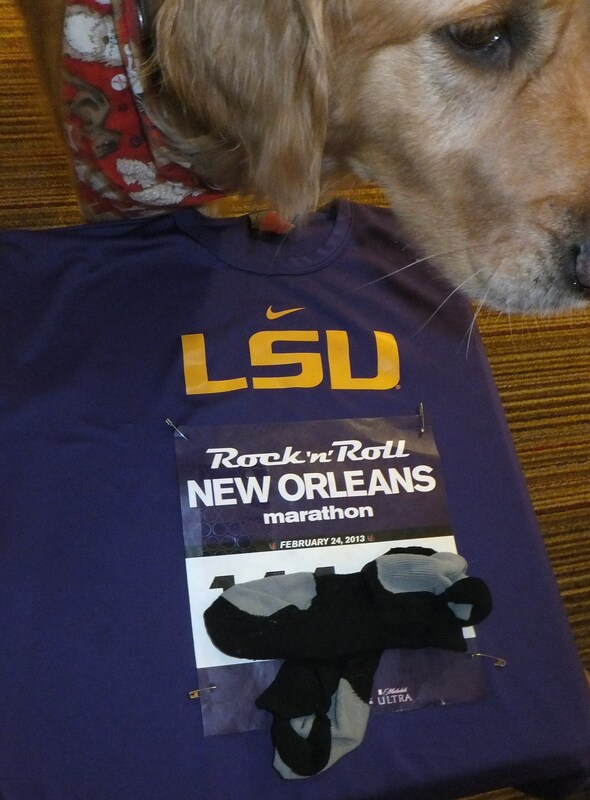 We were pleasantly surprised when my daddy reappeared in a relatively short period of time carrying his Rock ‘n’ Roll New Orleans Marathon swag bag. Now, if you are thinking Oscar swag bag (the one that was valued at $62,000 and included things like an African safari, jewelry, and personal training sessions), think again. The marathon swag bag included things like a commemorative running shirt (which you’ve already more than paid for in the registration fee), some stuff to put in the laundry so that your running clothes might possibly smell a little better (doubtful), some stickers that allow runners to brag about the fact that they are runners (like they don’t already do that enough), and something called goo that runners just love to eat (I’m a dog, and I wouldn’t eat something called goo). But, my daddy was happy . . . so we were all happy and ready for the big day. I just have one question about marathons: Why in the world do runners insist on starting these crazy things so early in the morning? The alarm went off at 5 o’clock Sunday morning. My daddy jumped out of bed like someone lit a firecracker under him, all excited and ready to go. I, on the other hand, chose to lounge for a bit. A couple of hours later, my mommy insisted that I get out of bed because we had to go see the half marathon leaders at the 8.5-mile mark, which was essentially outside of our hotel door. They were practically a blur as they raced past us. The man on the left is Mo Farah, who won two gold medals for Great Britain in the London Olympics last year. 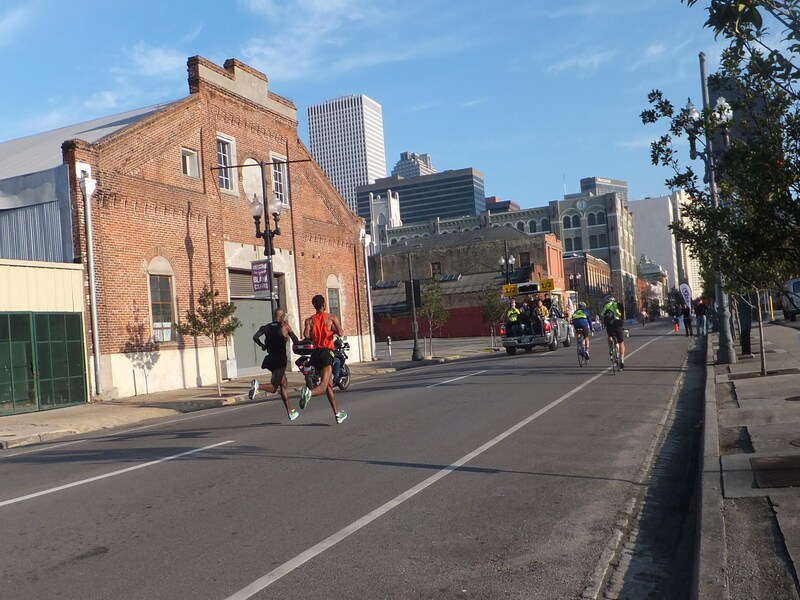 He finished the New Orleans half marathon in 1 hour and 59 seconds. That, as my humans explained to me, is a very big deal–a new British and course record. The man on the right is Gebre Gebremariam of Ethiopia, who won the 2010 New York City Marathon. His time in the New Orleans half marathon was 1 hour and 1 minute. Can you imagine running that fast (about a 4 minute and 40 second mile) for that long (13.1 miles) and then losing it by just one second when the winner sprints past you for the last 200 meters? Heartbreaking, but still quite an accomplishment. After the excitement of seeing the half marathon leaders pass by (and after going back to the hotel for a bit and then taking a little walk), I started watching for my daddy. Please take note of the beautiful blue sky. We only saw that on the morning the marathon. Do you think Mother Nature is a marathoner? 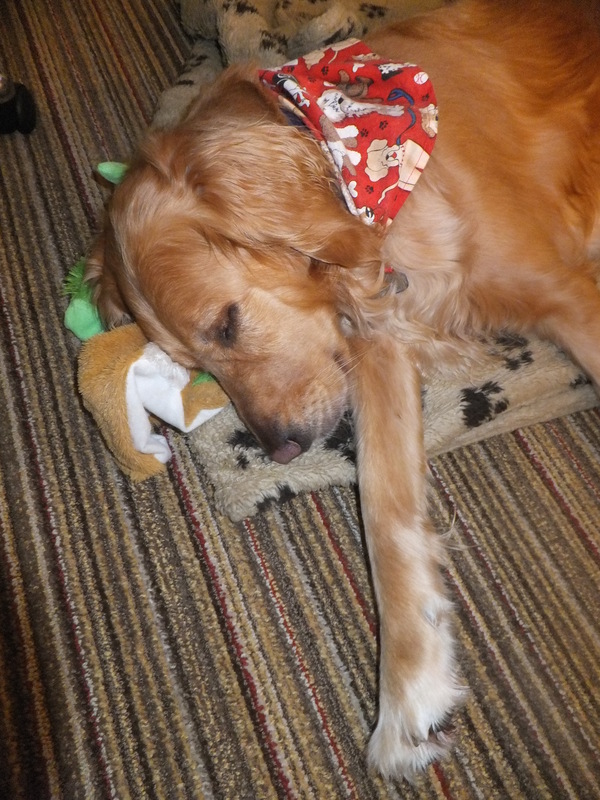 I started to get a little tired watching for my daddy, so I decided just to settle down and wait. When I finally got to see my daddy at 8.5 miles, I was so excited I simply couldn’t contain myself. I jumped up so high that I hugged his shoulders. 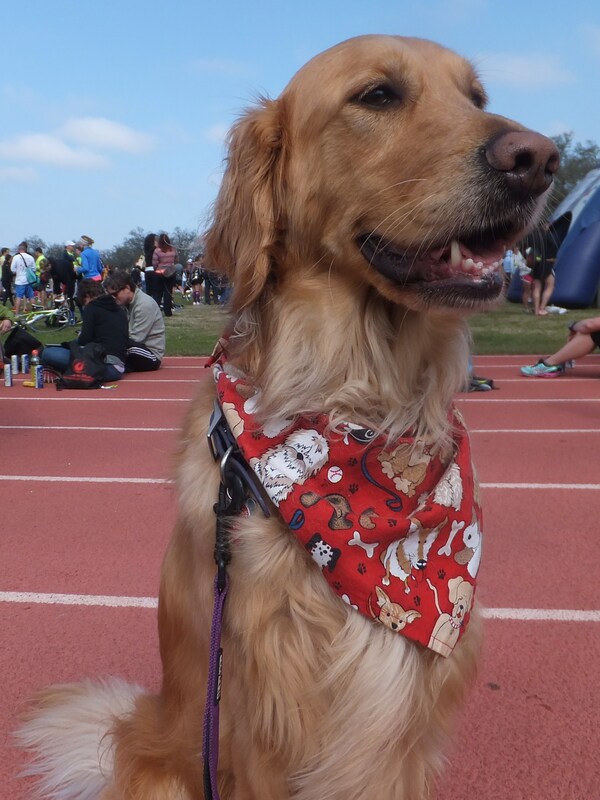 I think the other runners were a bit jealous of my daddy because they didn’t have a faithful Golden Retriever to give them love and encouragement. Sorry . . . I was saving all my love for my daddy. 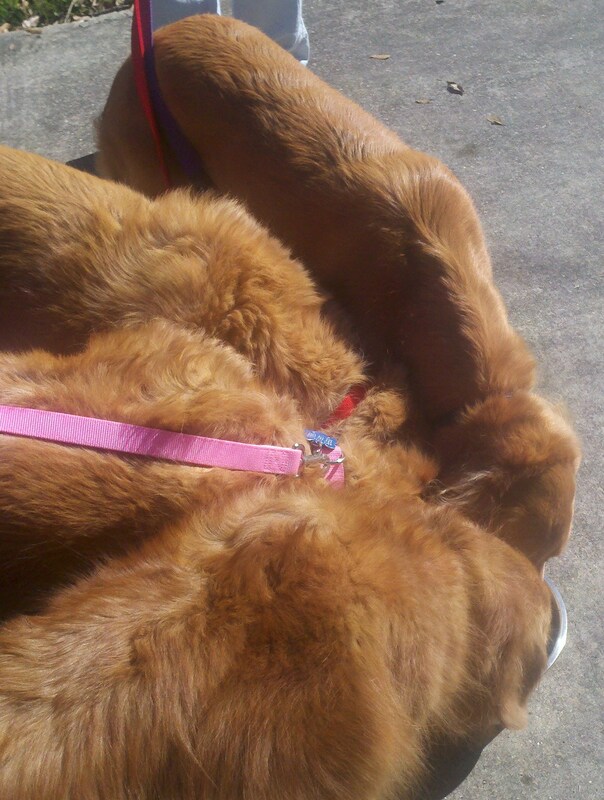 My mommy and I hurried back to my chariot and drove to City Park, where the race would end. That’s where we saw my daddy again at 13.5 miles. 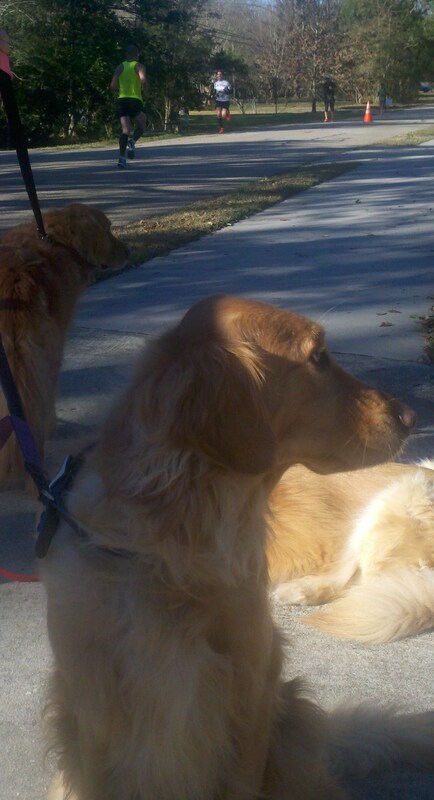 He looked so good and was running so well that I just had to bark, and bark, and bark. Then the really long wait started. It would be more than two hours before we would see my daddy at the finish line, so we headed over to the post-race party where the half marathoners were starting to gather to enjoy bananas and beer–two of my all-time favorite things, but probably not together! By the time we left to head to the finish line, I think I had been petted by more than a hundred people. It was heaven, but I needed to go so that I could congratulate my daddy on his 26.2-mile victory. OK . . . technically my daddy did not actually win the Rock ‘n’ Roll New Orleans Marathon, but he did run his third best marathon time; he felt good at the end of the race; he had fun; and he got a really nice medal at the finish line. That’s as good as winning it all in my book. I was very, very proud of him. Later that afternoon, we enjoyed the best part of marathon day: the post race burger and beer at Lucy’s Retired Surfers Bar and Restaurant. Apparently I caught the eye of the very nice Manager Rick. He appeared with a lovely grilled chicken breast, which he fed to me by hand. Bonus! I think I may be in love! 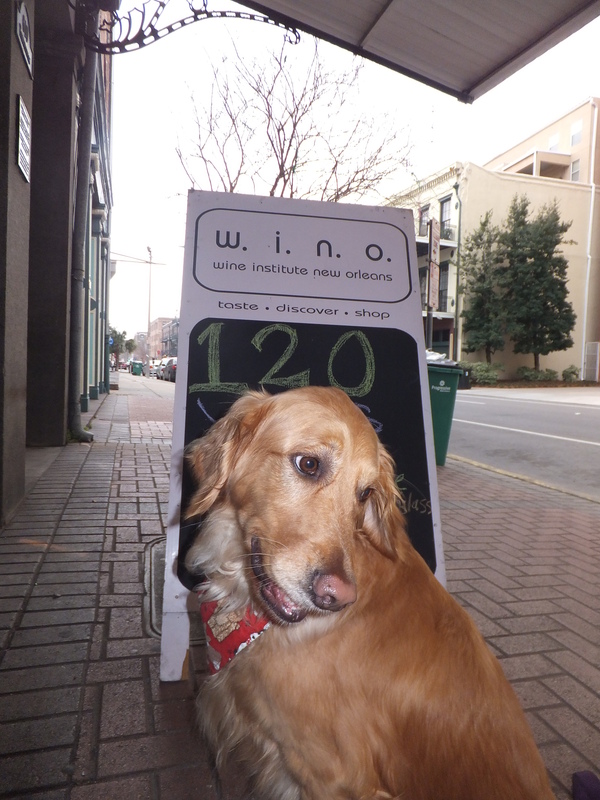 On the way back to the hotel, we made one final stop at W.I.N.O (the Wine Institute of New Orleans) to select a wine for my humans to enjoy as they watched the Academy Awards. While I was allowed inside, my mommy and I exercised extreme caution due to her fear that I might knock over some of the wine bottles. She should have known better. I don’t mind admitting that I was extremely exhausted on my ride home Monday morning. My marathon weekend had taken me to so many exciting places. I had experienced so many new things. I had met so many nice people and pups. It was one of my favorite weekends ever. After a bit of a break, I think I’ll start training for next year. As you know, I have been in serious marathon training mode. I have trained to be the perfect spectator, and I have trained for the post-marathon celebration. 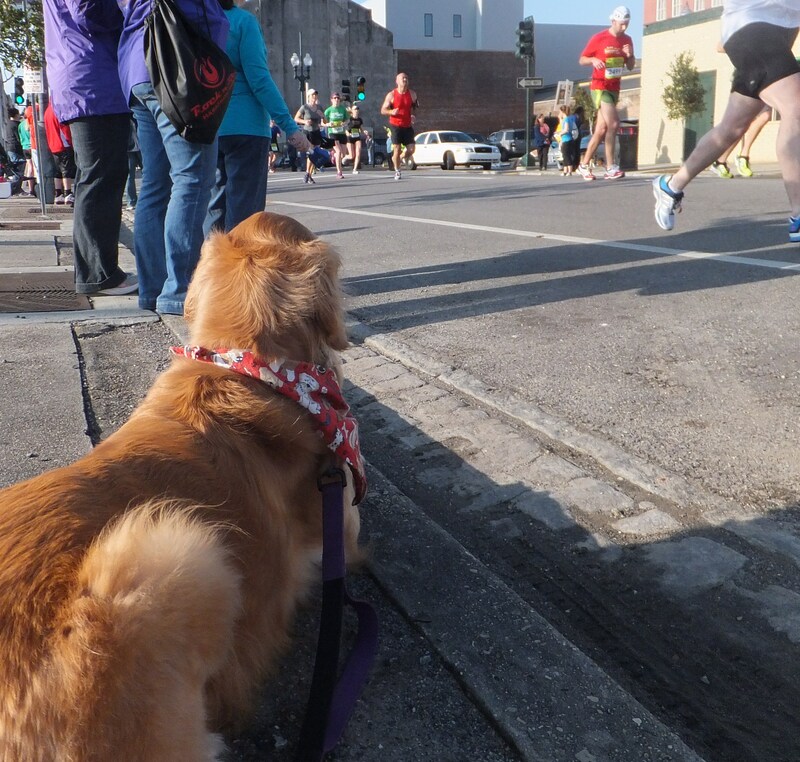 I am happy to report that all of my intense training paid off when I joined my humans in the Crescent City last weekend to help my human daddy run the Rock ‘n’ Roll New Orleans Marathon. 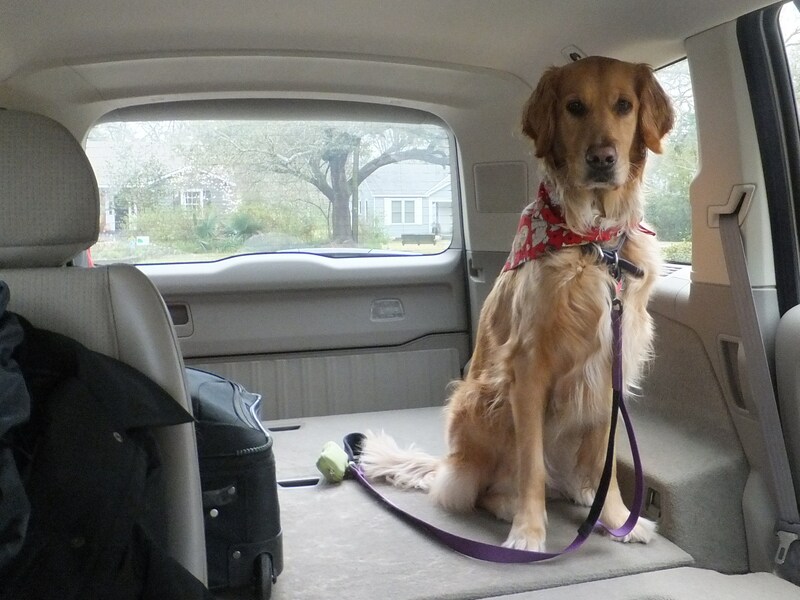 We loaded my chariot and set off on our big adventure early Friday afternoon. I wish I could tell you a little about the drive, but I’m afraid I can’t because I tend to get slightly sleepy on road trips. That’s why I leave the driving to my humans. It seemed as if I had just drifted off when suddenly we reached our destination. Look at me in the hotel room: in New Orleans less that 20 minutes and I already have voodoo eyes. 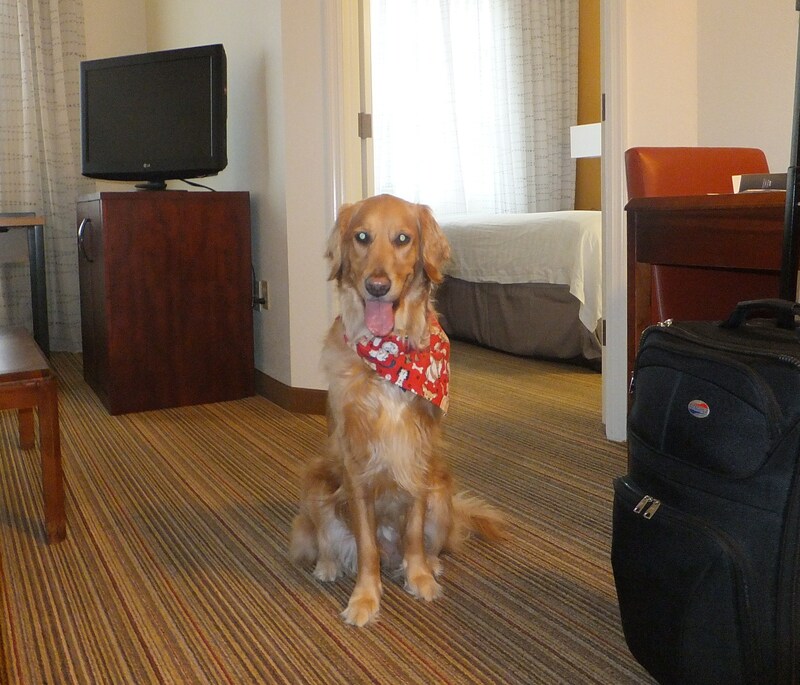 We stayed at the Marriott Residence Inn New Orleans Downtown. They are super pet friendly. It turns out that they are also human friendly. 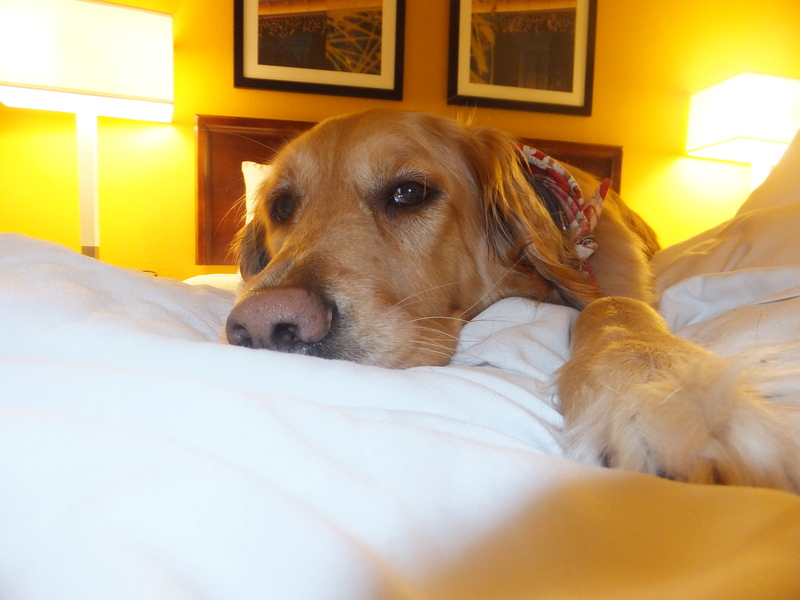 When the nice lady at the reception desk found out my daddy would be running in the marathon Sunday morning, she put us in a quiet courtyard room so my daddy could get a good night’s sleep before the big day. 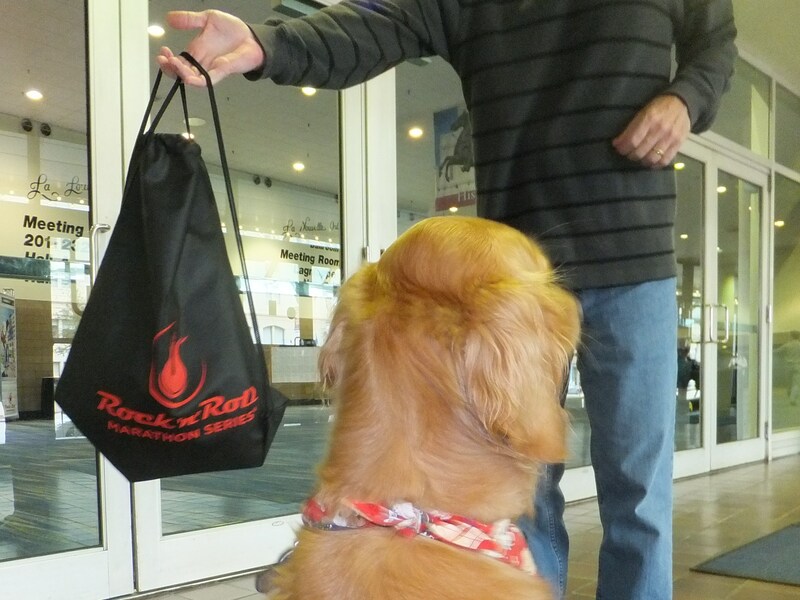 I love it when people treat my humans well! The hotel is in an area of New Orleans called the Warehouse District, which is home to lots of restaurants, bars, and loft living. 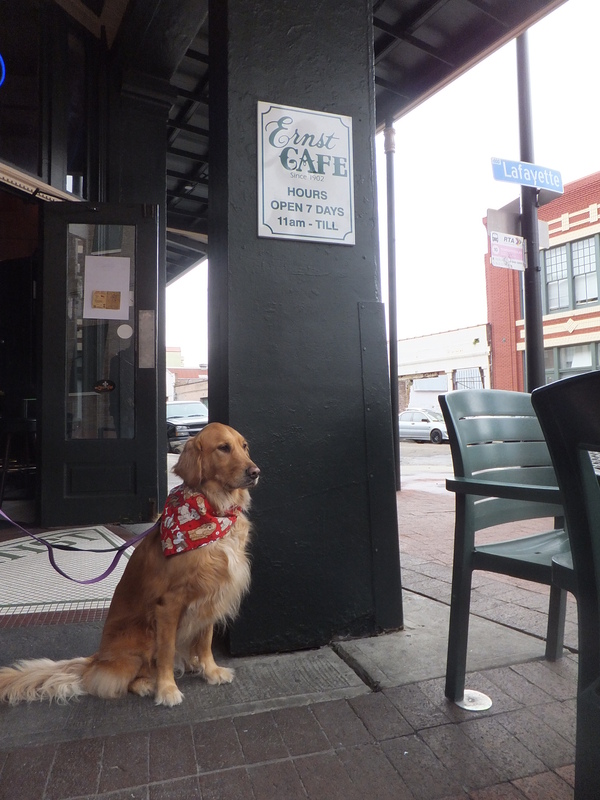 Our first stop, Ernst Cafe, was established in 1902 and welcomes pups like me. 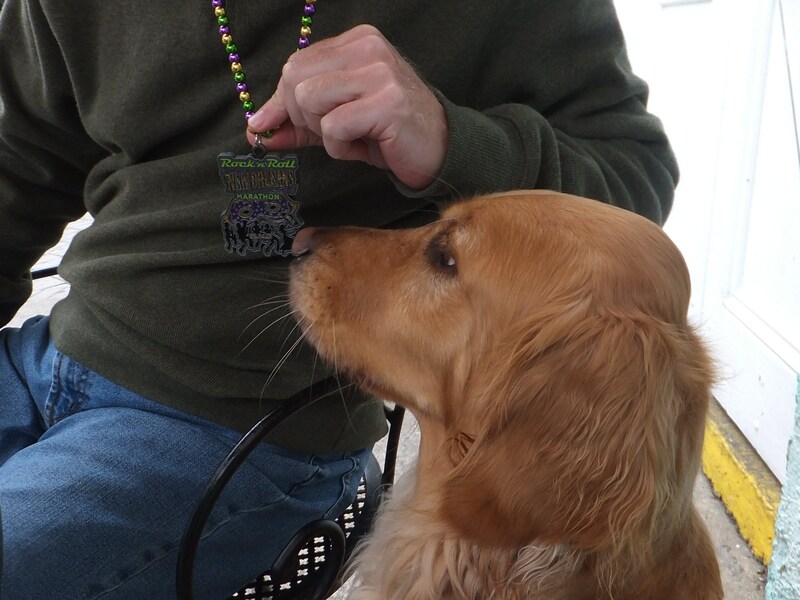 My humans enjoyed an appetizer and I had a little taste of the NOLA Blonde Ale. 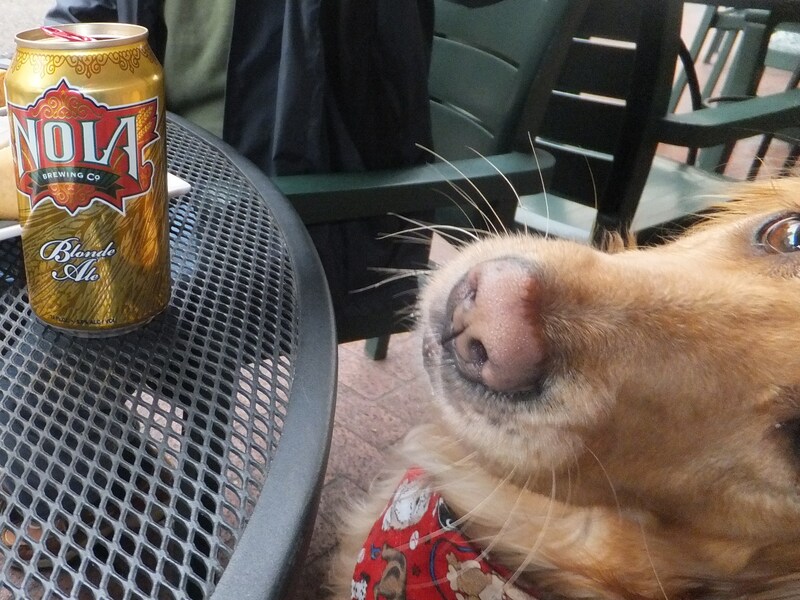 Doesn’t that just seem like a perfect beverage for a Golden Retriever? By this time, I was feeling extremely comfortable in my new surroundings. 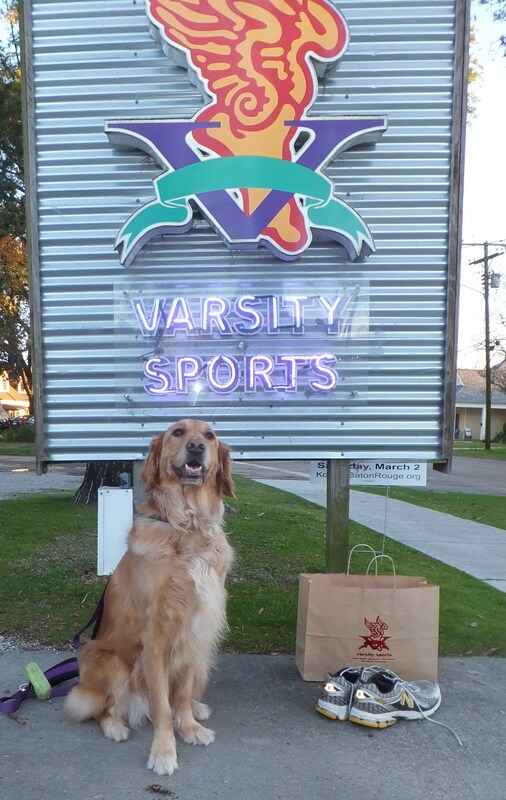 My humans explained to me that they would be going out that evening to grab a quick dinner and watch the New Orleans Hornets play a basketball game. I would be home alone in the hotel room for a little while. PARTY!! Home alone for the evening in a nice hotel room with a nice bed all to myself? What’s not to like about that? Actually, I was a very good girl. 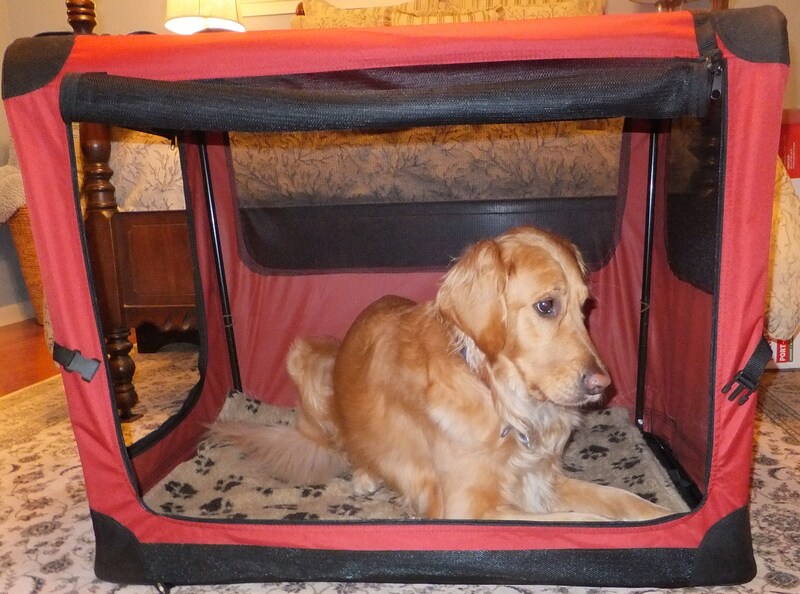 I stayed in my new travel crate, because those are the house rules, and I was very, very quiet. If you must know the truth, I actually welcomed the time to myself for a little rest and relaxation because I knew that the next two days would be action packed. 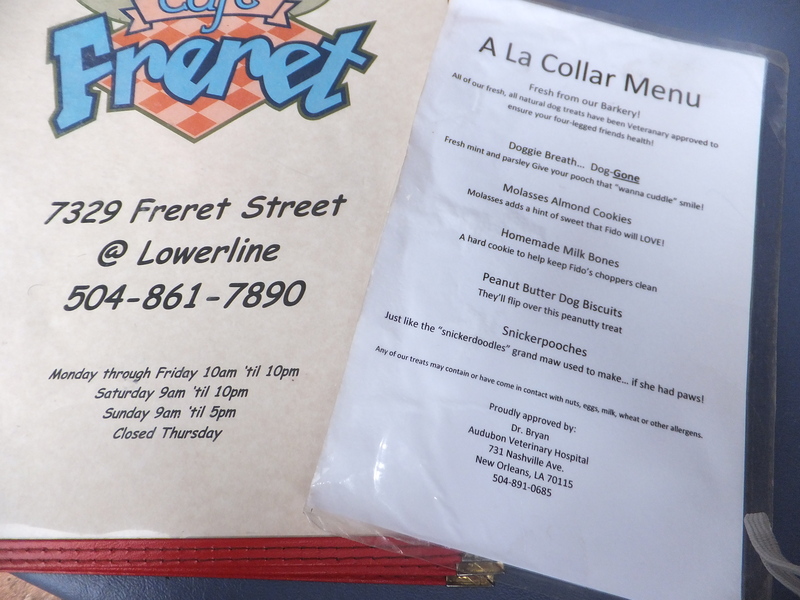 After a night of really loud thunderstorms (I slept through it all, but my humans apparently heard everything), we jumped into my chariot Saturday morning for a short drive to the Garden District, a beautiful area of New Orleans and home to Cafe Freret. 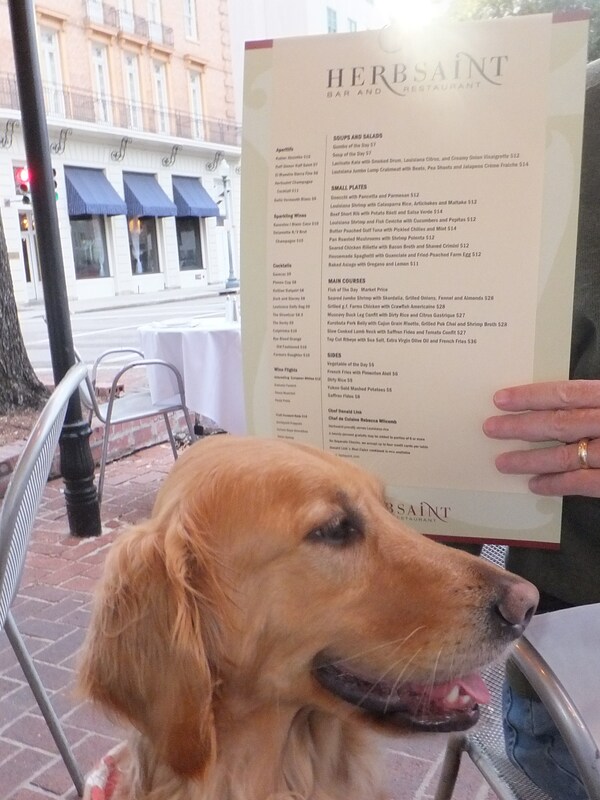 I perused the A La Collar Menu and settled on the Peanut Butter Dog Biscuits . . .
. . . which I thoroughly enjoyed as my humans ate their brunch. We had planned on a nice walk in nearby Audubon Park, but unfortunately the thunder and rain returned just as we were finishing our lovely meal. So we stopped to visit with a couple of other dogs who had accompanied their humans to brunch and then quickly hopped into my chariot for a drizzly ride back to the hotel. They say every cloud has a silver lining. In this case that silver lining was a much-deserved afternoon nap as the raindrops fell outside. After my nap, feeling completely refreshed and ready for a big night on the town, I joined my humans at Herbsaint Bar and Restaurant for an early dinner. 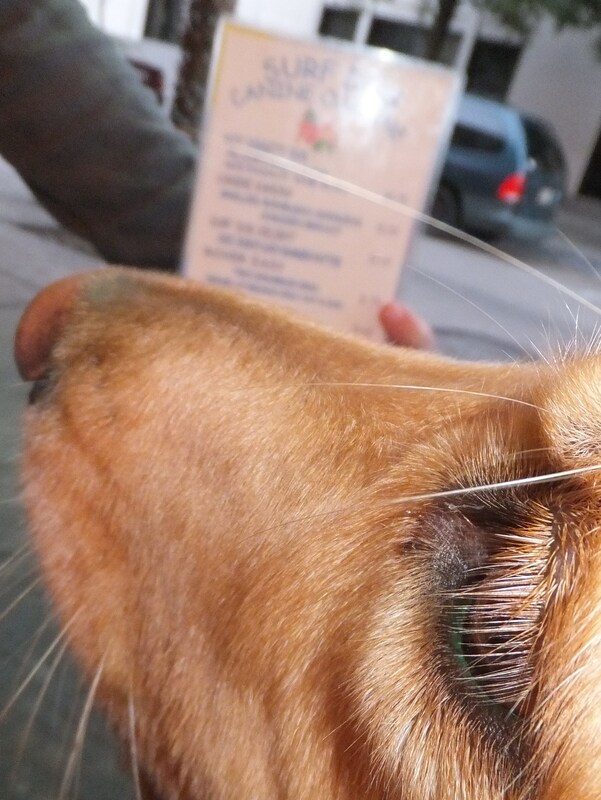 Herbsaint is one of those odd restaurants that only has a menu for humans, but they are happy to seat dogs outside and they are generous with their containers of water. I think dining outside at Herbsaint is fascinating because I get to watch the St. Charles Avenue streetcar rumble up the street ever so often. My humans really seemed to enjoy their meal; they all but ignored me and I had a nice rest under the table.When we got up to leave, the man at the table next to us said, “Oh, I had no idea there was a dog over there.” That’s what my humans like to hear! 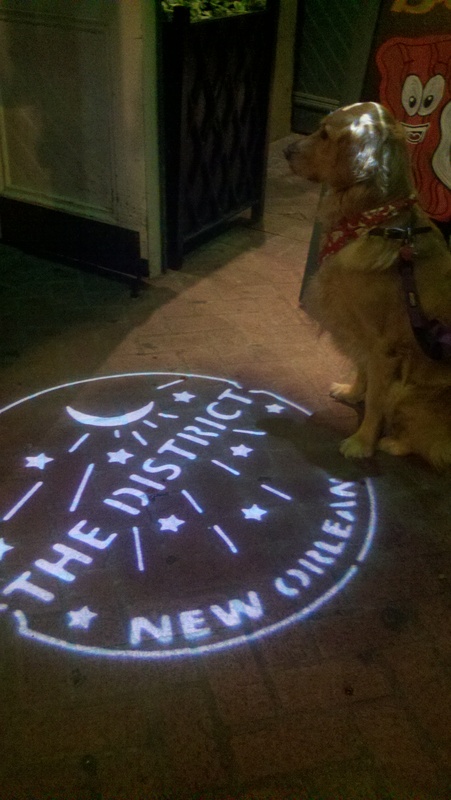 As we made our way back to the hotel, we walked by an establishment called The District. We had passed this place several times over the last couple of days, and each time I had pulled in a very uncharacteristic manner to go into its open doors. 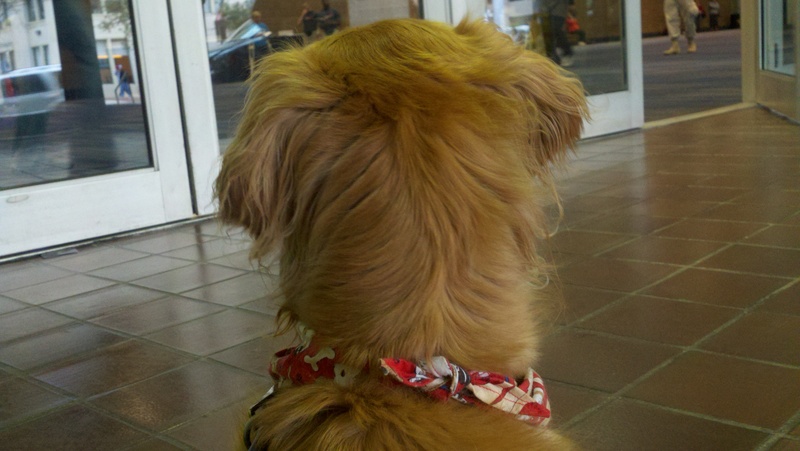 My humans were under the impression that I would not be allowed inside, so they had discouraged me each time. This time my human mommy suggested that my daddy ask the bartender if I might just walk in for a second to get this desire out of my system. That’s when the bartender informed my humans that I was more than welcome in The District. Obviously . . . I knew this all along. Once inside, I had a grand time meeting and greeting so many nice people. 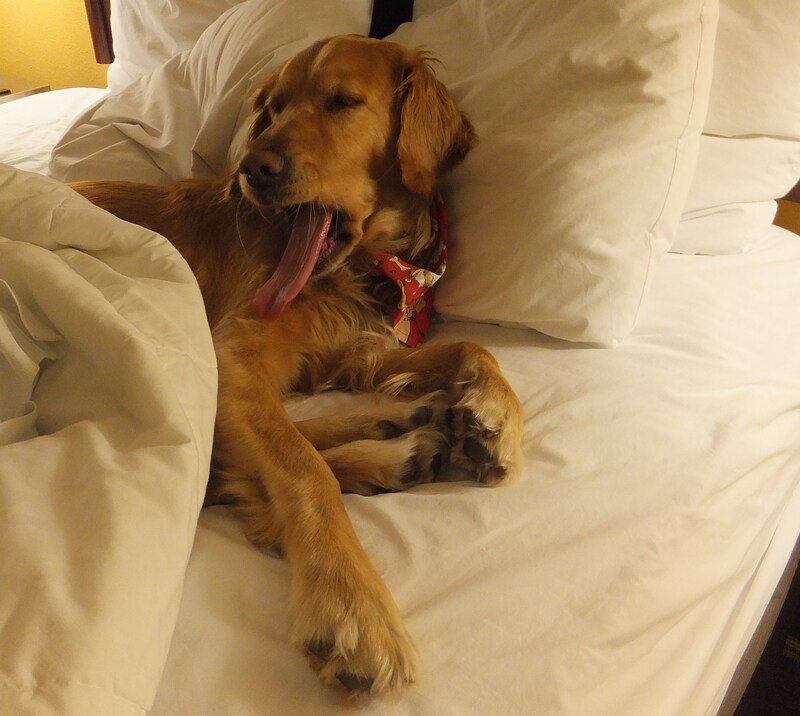 As much fun as my humans and I were having, though, we knew that we needed to call it an early night and get a little rest before the big marathon. Little did I know what fun awaited me the next day. The most amazing and wonderful thing happened to me last week. 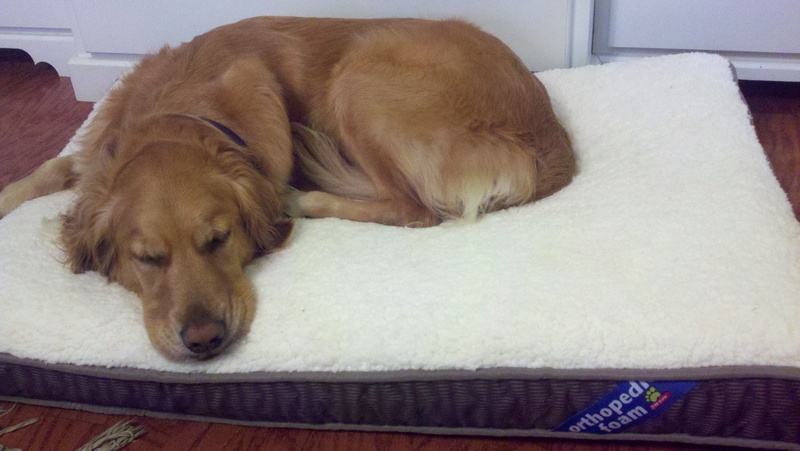 My humans left the house (no, that wasn’t the amazing thing) and when they came home they had two new beds for me . . . plus a travel crate. That must mean that (1) they love me very much and want me to have a good night’s sleep (as if my very sound sleep could get any better) and (2) our trip to New Orleans to see my daddy run in his marathon is getting closer. Yippee! The hotel where we are staying in New Orleans requires that their canine guests have a crate, and that they stay in their crate in their room when their humans are away. I am fine with that. I was crate trained as a puppy and I loved my crate. 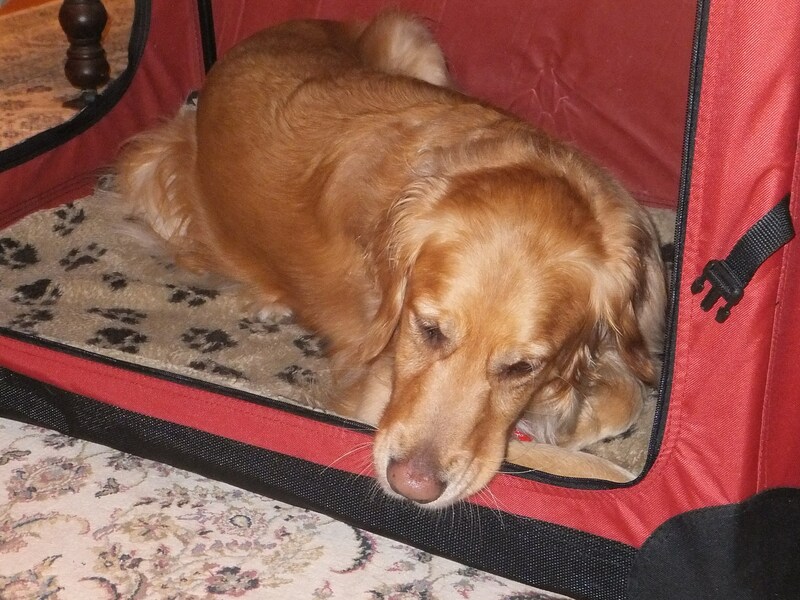 In fact, I still slept in my crate until a few months ago. 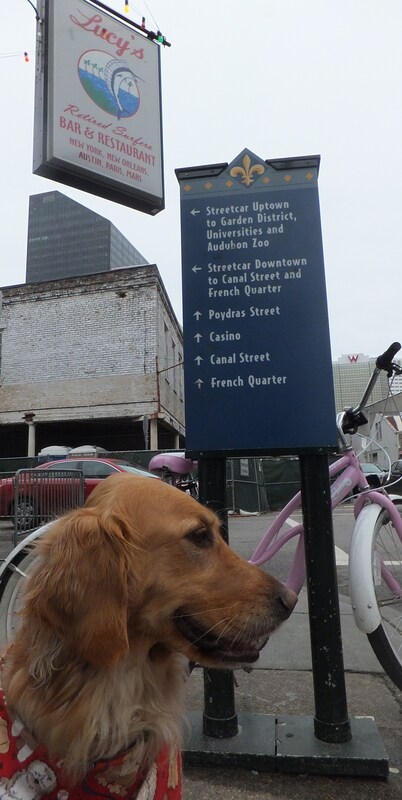 I traveled to New Orleans once before with my humans. They brought my big, metal, somewhat awkward-to-manage crate and set it up in the hotel room. I heard much grumbling from my humans on that occasion, so I suspected that they would make alternate arrangements for this trip. And voila! My new travel crate appeared. It is light, easy to carry, and the humans marveled at what a breeze it is to set up. I think my humans are very happy with my new travel crate . . . maybe even as happy as I am. I cannot wait for my trip! You know how humans can be. When they go to the store to buy just one thing, they usually come home with at least one other thing. Such was the case when my humans went to get my travel crate. They decided that I also needed to have new beds. Now, I have written before about my beds, so you know how near and dear the old ones were to me. I had my den bed, my bedroom bed, my $64 bed, and my princess-and-the-pea bed (which was just my den bed placed on top of my bedroom bed). Well, I still have my old $64 bed (it’s the one you see inside of my new travel crate), but now I have a new den bed and a new bedroom bed. I am in heaven. 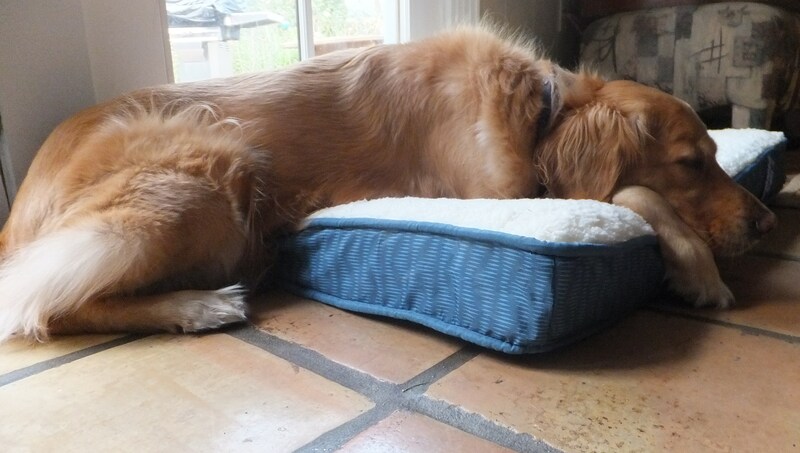 At first, I wasn’t too sure what to do with my new beds. That wooly top reminded me of a stuffed toy, so I tried to find the squeaky inside. 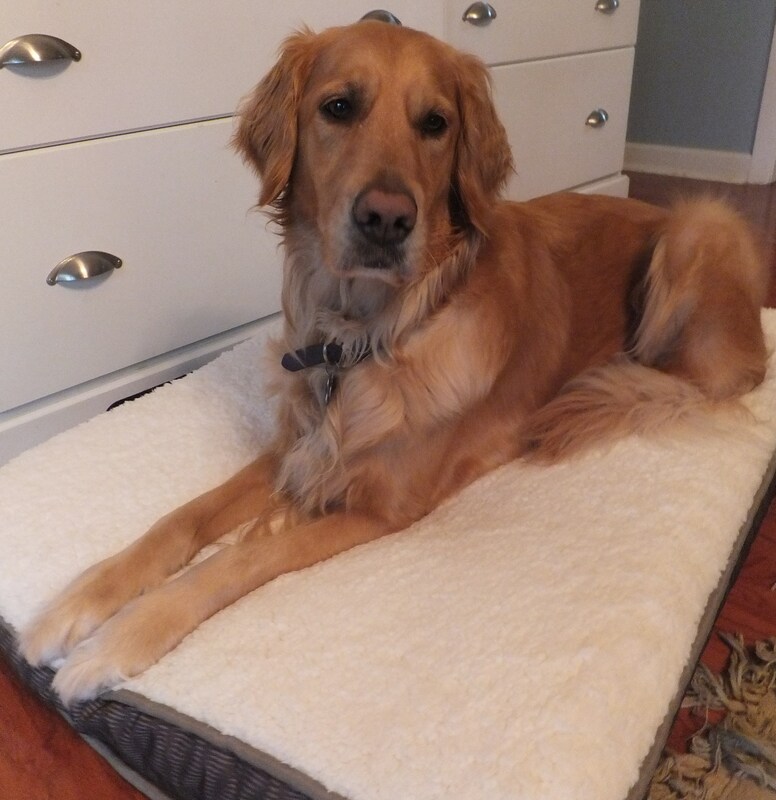 I was quickly informed that chewing on the new bed in search of the non-existent squeaky is unacceptable behavior. Gotcha. 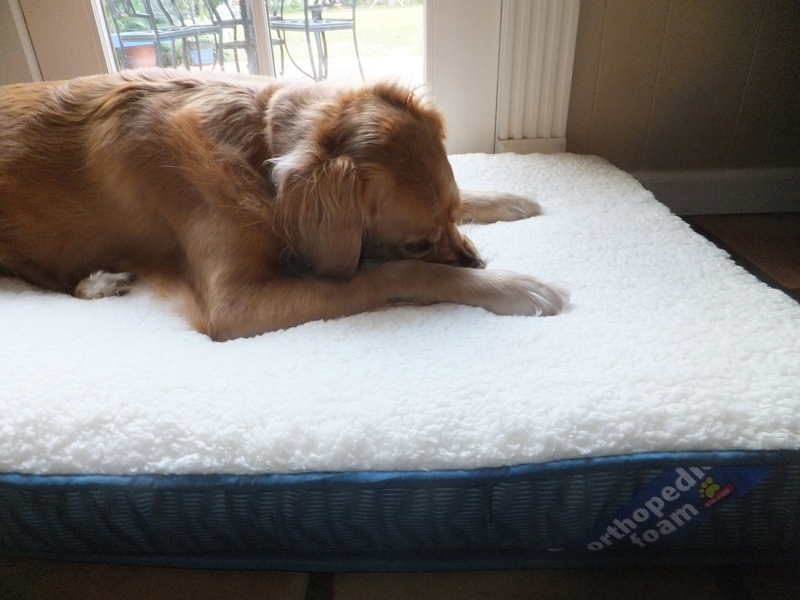 Then I had a little trouble trying to get my whole body onto the new bed. Don’t ask me why, I just did. But, as you can see, I quickly figured out how to get my entire body onto my new beds, and I have been sleeping like a baby ever since. It’s good to be loved. Sleep tight, friends. 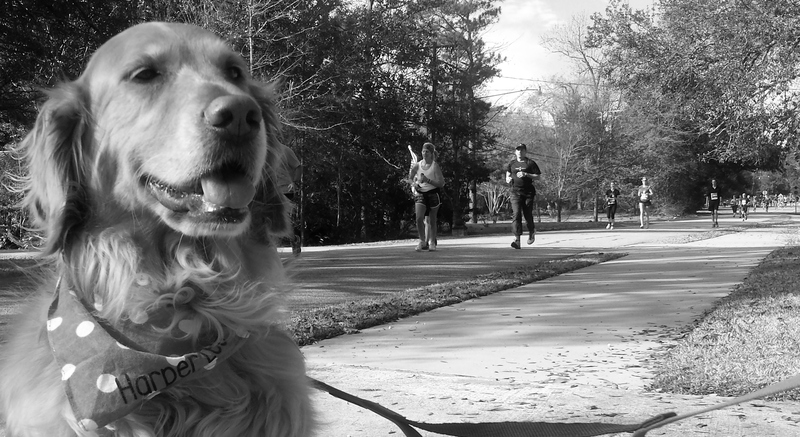 A few weeks ago, I started training for my human daddy’s upcoming marathon. 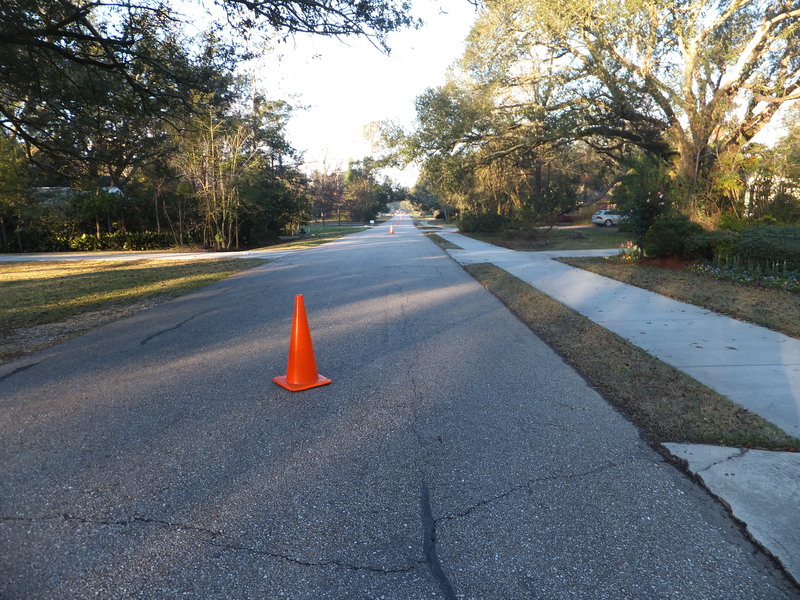 I began with spectator training–and I think I have that down–but there is so much more marathon prep to be done. Last night we went to the shoe store to choose the shoes my daddy will wear for his marathon. Shoes are not that big of a deal to me (did you ever think you’d hear a female say that? ), but they are extremely important to my daddy. If you ask me, the new shoes in the bag are not that much different from the old shoes, but whatever makes my daddy happy. 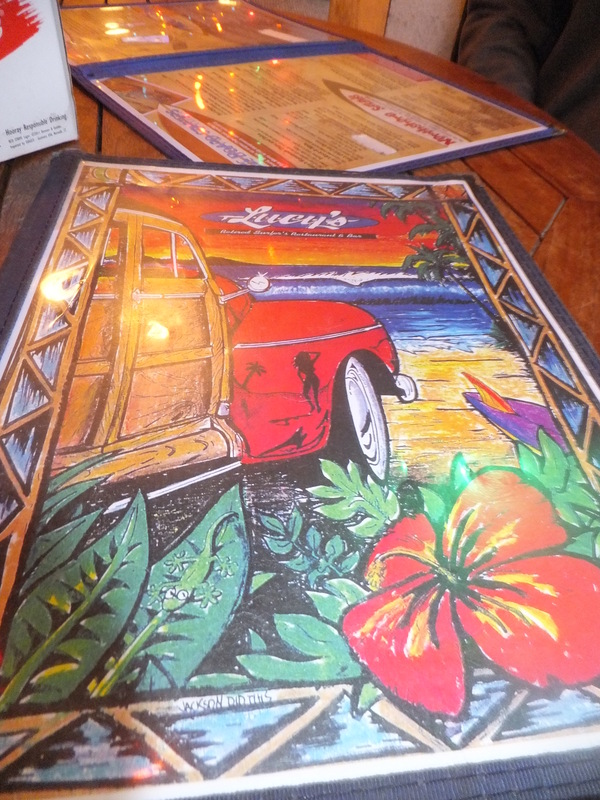 Finally, we headed downtown for some marathon prep that I found much more interesting–dinner at Lucy’s Retired Surfers Bar & Restaurant. 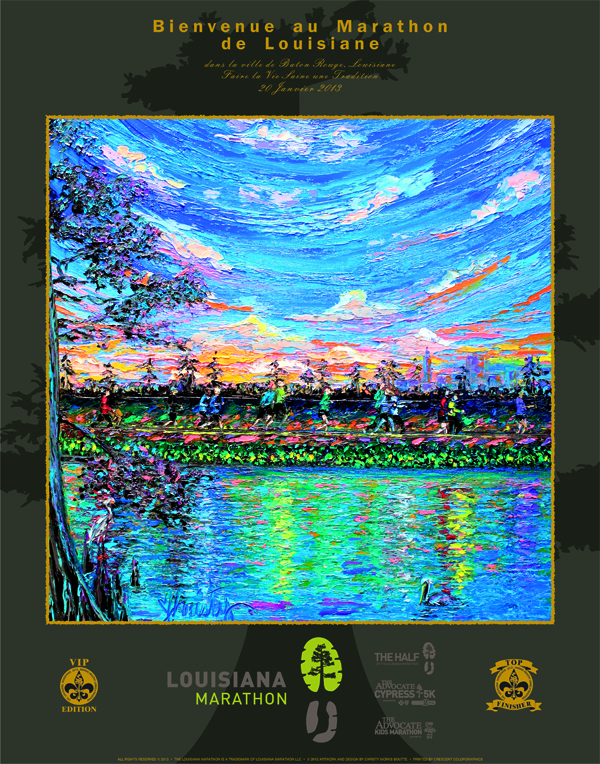 Now you may be wondering what dinner at Lucy’s in Baton Rouge has to do with the Rock ‘n’ Roll New Orleans Marathon. I’ll tell you. 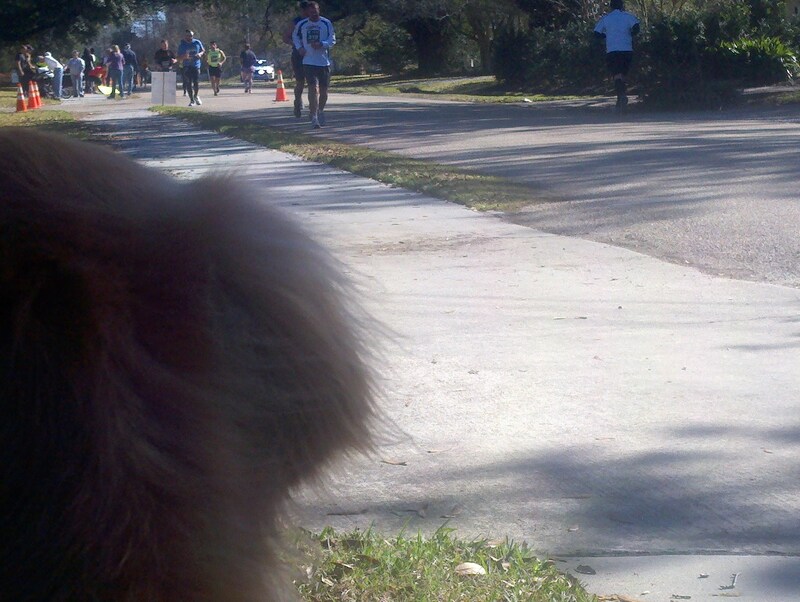 In less than three weeks, I will be enjoying (with my humans, of course) a post-marathon meal at Lucy’s in New Orleans. After my daddy completes his marathons, he likes to devour a beer (or two) and a big, juicy cheeseburger. He figures he’s earned it after running 26.2 miles, and I can’t disagree with him. 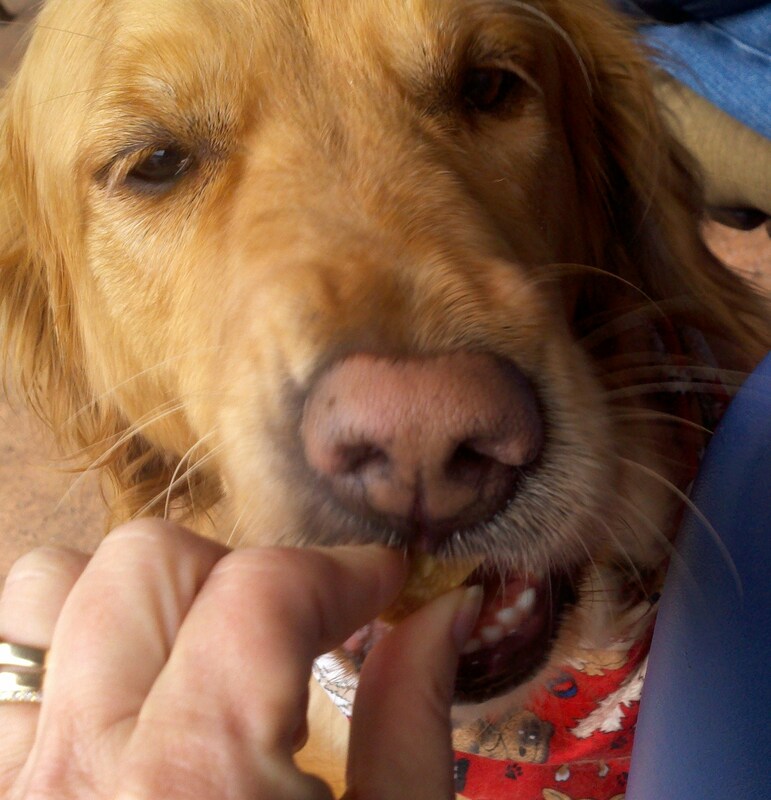 I love Lucy’s because it is pet-friendly . 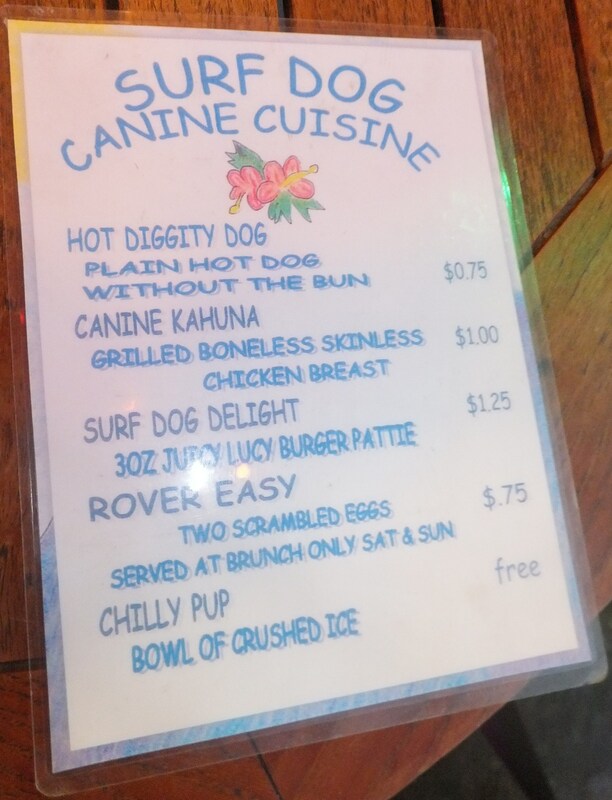 . . so pet-friendly, in fact, that it even offers a special menu for its canine customers. I have been to the Baton Rouge Lucy’s many times, and I even visited the New Orleans Lucy’s one late night after a Hornets basketball game (that’s a long story that I may share another time), so I very much approve of the humans’ choice for the post-marathon meal. Last night, I studied the menu very carefully and made some outstanding selections. 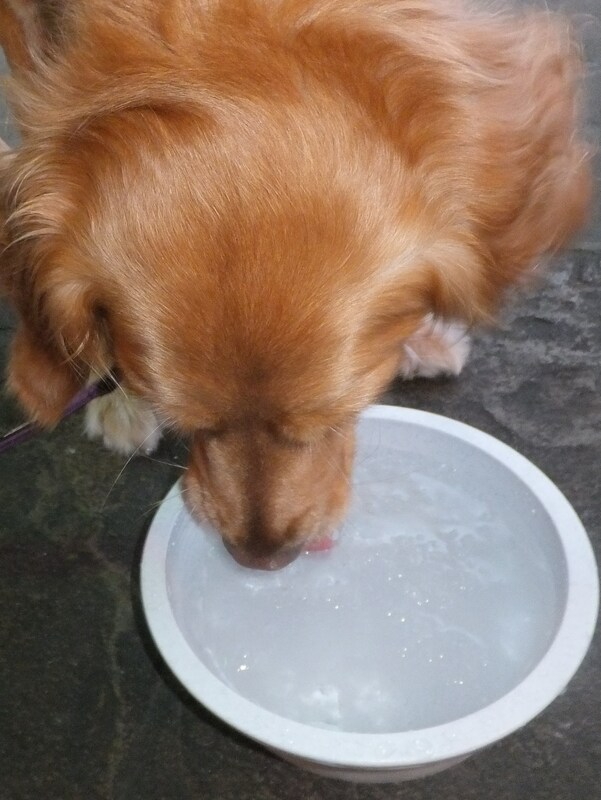 I started with the Chilly Pup (that’s a bowl of crushed ice to humans). It’s free, and you don’t even have to ask for it. The server just brings it to you. 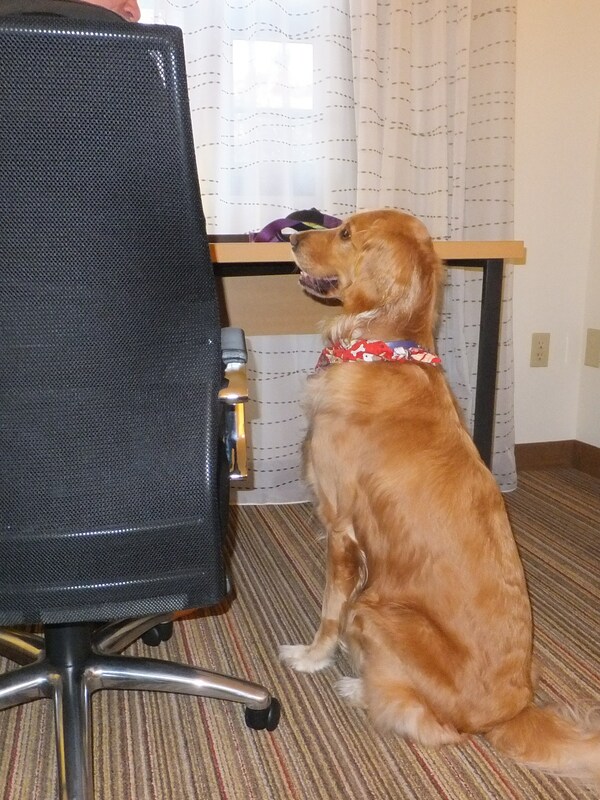 I told you this place is super pet-friendly. Then I had the Hot Diggity Dog. It’s a plain hot dog without the bun and it only sets you back 75 cents. How can you beat that? 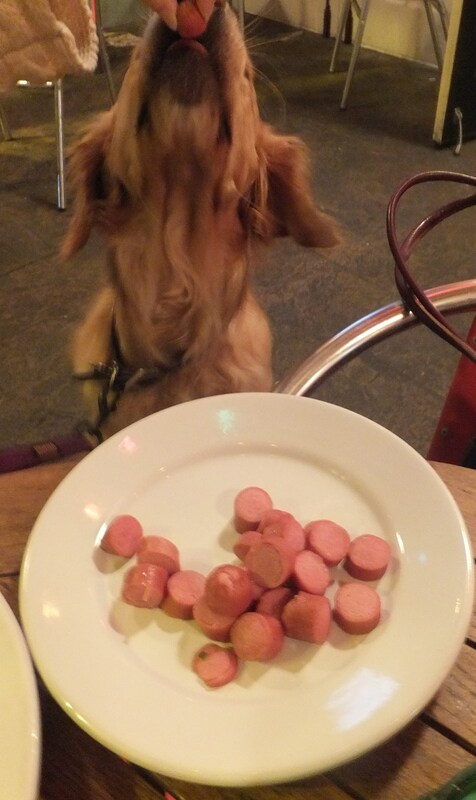 At first I was a little more curious about what was on my human mommy’s plate . . .
. . . but then I got pretty interested in the Hot Diggity Dog. 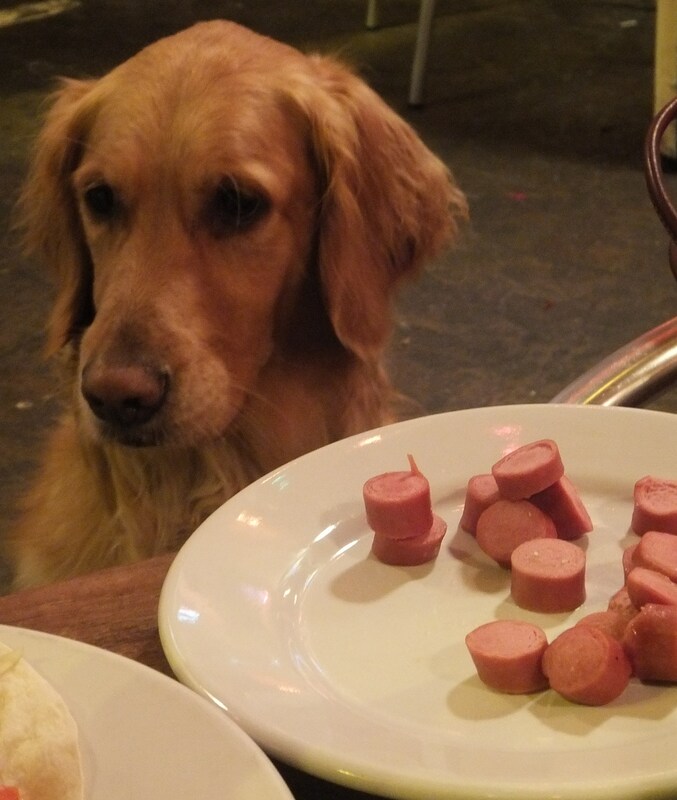 Let’s just say that there wasn’t anything left to put into the doggy bag. I think I nailed the latest phase of my marathon prep. 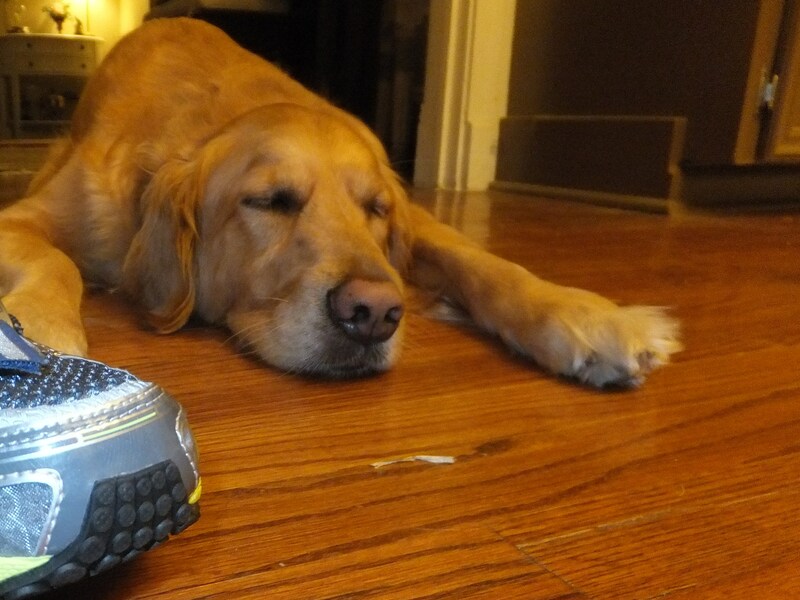 Maybe I’ll just spend the next couple of weeks guarding the new shoes. I’ll start just as soon as I wake up from my nap.